This new business school and continuing education campus is an adaptive reuse of a former downtown department store. 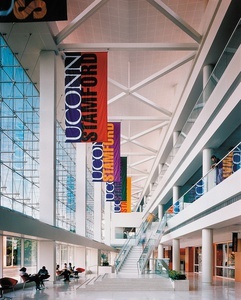 As part of a comprehensive new identity system, colorful banners were created to identify the new school, and various flags to mark the library, bookstore, registrar’s office and cafe. Other signs utilize this colorful palette to code the university’s departments, and to aid in wayfinding. The sign program was planned in collaboration with Perkins Eastman Architects and keynoted at the Society of Environmental Graphic Designers Campus Planning Seminar.